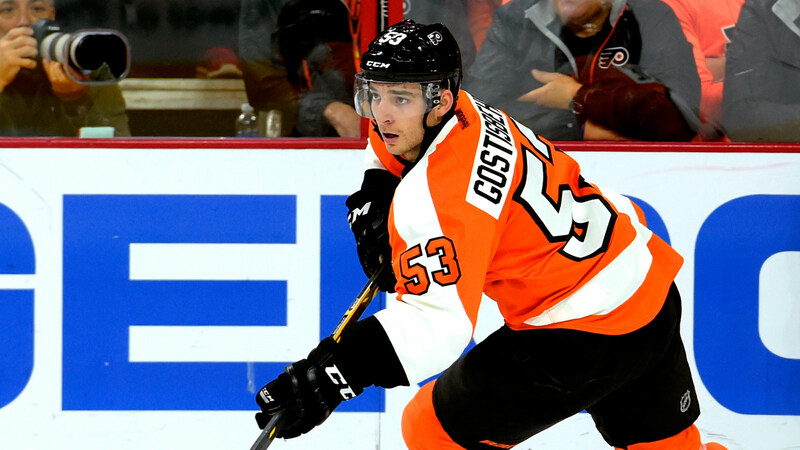 Last season was supposed to be a breakout year for Philadelphia prospect Shayne Gostisbehere, a promising young defenseman who excelled during his three seasons at Union College ahead of turning pro. But instead of translating that success to the professional level, Gostisbehere received a lesson in patience. The former third-round pick suffered a torn ACL in his left knee on Nov. 7 and missed the entire 2014-15 season. He played just seven games combined between Philadelphia and AHL affiliate Lehigh Valley before the injury. Rehabilitation proved long and difficult for Gostisbehere, but he did not mind turning to others for a bit of a boost. Gostisbehere told Philly.com he had a little help in his recovery from man's best friend; during the lonely days attempting to recover in Philadelphia, Gostisbehere decided to adopt a French Bulldog named Cooper. Gostisbehere also told Philly.com that he had a sympathetic ear in his sister, Felicia, who was a world-class figure skater before double hip surgery ended her career. "She helped me through it a bit, just staying focused on the positives and not too much on the negatives," Gostisbehere told Philly.com. "It's ups and downs with this injury. I'm glad that process is over now, of course. I'm just chomping at the bit to get going." Gostisbehere is starting the comeback with some time at prospect development camp this week in Voorhees, N.J. He also has a chance to get to know some of the other defensemen on the depth chart as he looks to impress the Philadelphia brass enough to have a shot at making the NHL team out of training camp later this summer. But more than anything, Gostisbehere told Philly.com he just wants to play hockey. "Of course everyone wants to be on the Flyers, but, again, most importantly for me, I just want to get on the ice and play a game," Gostisbehere said to Philly.com. "I want to get a year of pro hockey under my belt, not just seven games."